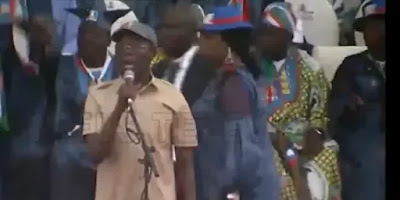 The All Progressives Congress, APC, presidential campaign, Monday went wrong as hoodlums greeted President Muhammadu Buhari and the party’s national chairman, Comrade Adams Oshiomhole with stones at the MKO Abiola International Stadium, Kuto, Abeokuta. Things turned sour when the APC National Chairman mentioned the name of the party’s governorship candidate in the state, Mr Dapo Abiodun, while addressing the crowd. President Muhammadu Buhari spoke after Professor Osinbajo and when he raised Dapo Abiodun’s hands as the APC flag bearer in the state, the anger returned with some still throwing things forward.